The taxi arrived early. A relief. I settled up with my hostel and left in my cleanest shirt for the journey that waited. The morning had two important stops. My first was to meet a twitter friend, @theexplorateur, for coffee and to say thank you. She was the very reason I received a guest passage on the ‘Soul of South Africa.’ Then to my second stop, the Pretoria Train Station to board the Blue Train. For me train travel in the States consisted of commuter rails such as the LIRR, MetroNorth and the NJT with the occasional Amtrak from Penn Station to Union Square; nothing fancy, but this was different. Much different. The elegant experience of the Blue Train began as soon as I exited the taxi. Porters and staff surround you and cater to your every need. Suddenly after a “Mr. Zabransky, follow me” (they knew my name) I settled in to my first mimosa waiting to board. Immediately I was in good care. That became the constant theme. Then suite seven (my suite) was asked to board and I climbed on to meet my butler. He introduced me to my room; spacious, comfortable and comparable to a luxury hotel room on a train (and much better than my prior night in the hostel). Afterwards, I decided to explore and walk down to the last rail car, the observation car. “Would you like something to drink?” Why, yes. Yes, I would. Bloody Mary time. Not my usual, but this called for a change, it was not a ‘usual’ train ride. 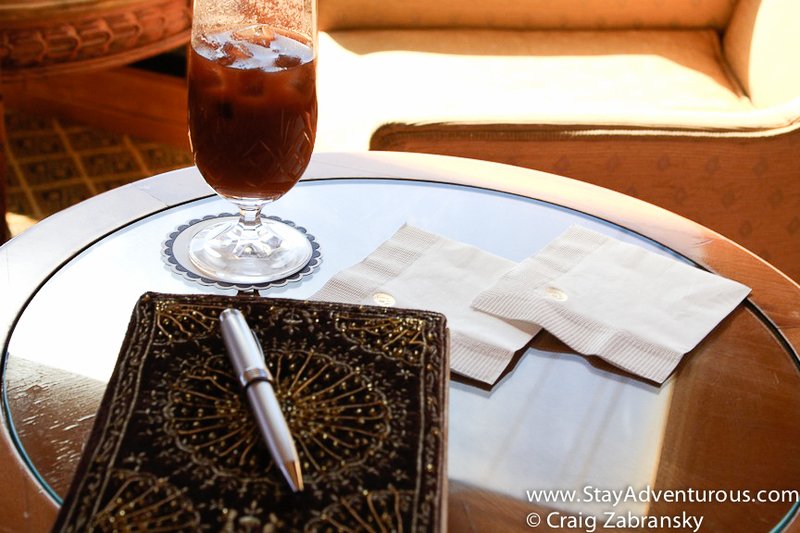 my bloody mary and my journal - a perfect start to any day. The city became countryside as I looked through the panoramic windows. My passage began. I lunched with fellow Americans and dined with Englishman. Both Blue Train meals were delicious. Both conversations entertaining, and in between (and after) we took leisure, socialized and listened to World Cup matches swapping stories from our African adventures. Yes, we listened, the Blue Train doesn’t have live TV (nor would I want it to). But it’s the World Cup! Crisis averted. A butler shared his transistor radio. A perfect fit. It not only added charm, but allowed us a chance to travel mentally. A chance to time travel to a time when people gathered around to listen to a radio – a different era. We listened in English, Afrikaans, and local tribal languages as stations came in and out across the countryside. At times, we even asked the bar tender to translate his language. Nearly perfect play-by-play. Nearly. Even the afternoon high tea seemed oddly perfect with the World Cup broadcast in the setting. We enjoyed tasty delights, cocktails and camaraderie. It seemed to remind us all of simpler times and a simpler way. 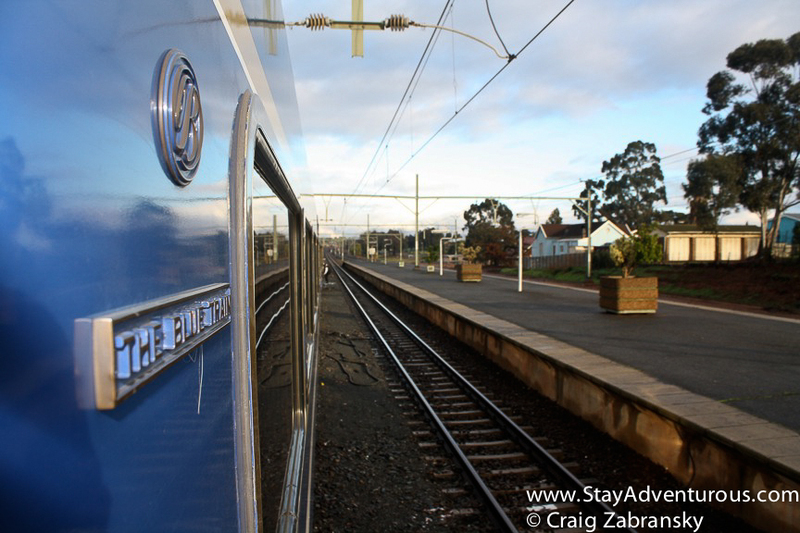 What train travel represents, and frankly, why I like it – especially in Blue Train style. The following morning, after a night capped off by a Cuban cigar and a heated cognac, the train descended on Cape Town. Through the mountains, we started our passage through the most scenic part of the trip. We entered the South African wine lands. 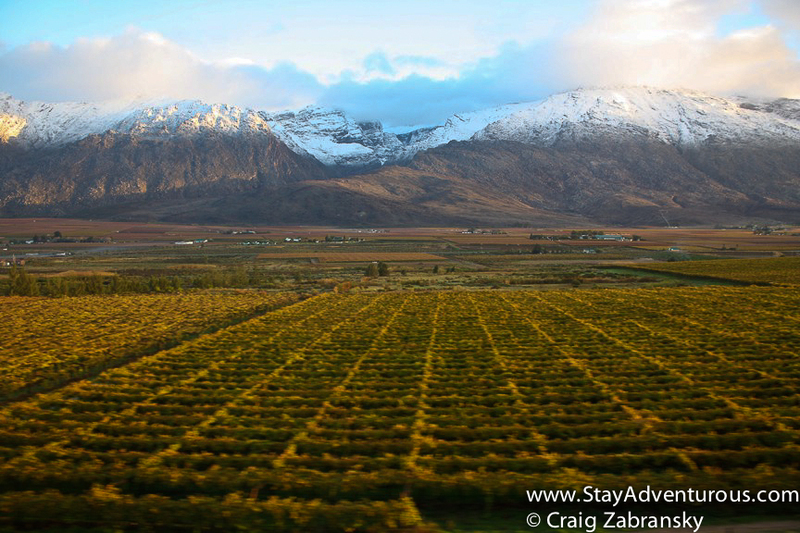 To our good fortune, a rare dusting of snow accented the mountain peaks which also accented the view. Not the typical scenery you think about when one considers Africa, but most don’t think of the Blue Train either. Yet both deserve mention. 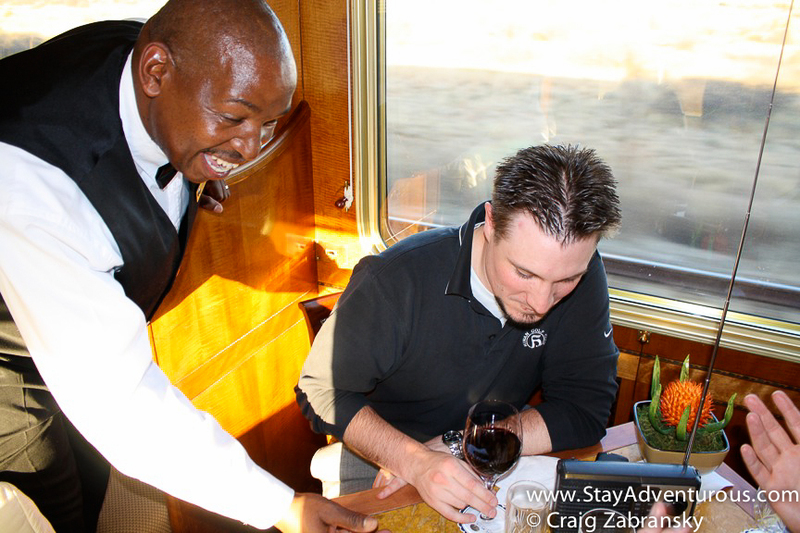 Certainly, the Blue Train provides the elegance in the lounges, guest suites and culinary excellence. A true treat for the traveler. Yes, it provides transport from Pretoria to Cape Town, yet the true journey joy is no different than any other journey; the people. He summed it up perfectly. Awesomeness indeed. Also, this post is part of my special series All Africa – All August; a full month dedicated to my African Adventures. And I’d like to thank the Blue Train for providing passage. What a lovely post/story! 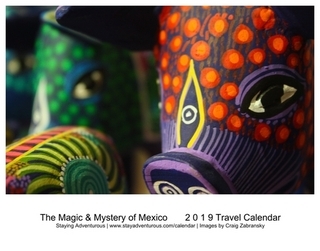 Thanks for posting your positive experience, it made for nice reading, not to mention the tasteful pictures! I am jealous of your delightful trip! I don’t know why, but this reminded me of the movie Indiana Jones. LOL! I’ve bookmarked this post as it’s definitely on my must-do list. Most of the stories I’ve heard about overnight train travel through Europe don’t seem to compare. There is another luxury train that goes to Machu Picchu that I’m also researching. It’s great to know that experiences like that are still around, as opposed to ye olde Amtrak Northeast Corridor line. Thanks for sharing. How long was the total ride? Mike, It took twenty-eight hours from Pretoria to Cape Town. But the train has other (less famous) routes too such as the Garden route and also to Victoria Falls. W-O-W. 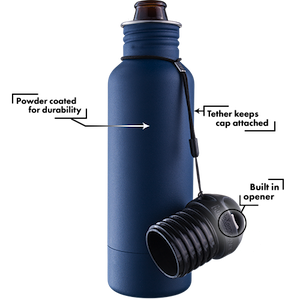 If only…………it was available here in the US. Great post! What a fantastic opportunity. I’ve heard only wonderful things about the Blue Train. But I certainly agree — ultimately, it’s the people you meet along the way that makes a trip outstanding. Thanks for sharing this story Craig. It makes me think of old B&W movies where people traveled in suits and ties by train. Maybe I need to get out more! Or perhaps when people used to ride horses in the West with trains connecting OK Saloon to the big cities of the east. And yes, you need a tie for the formal dinner. I had to borrow one. Certainly this is one of the best advertisements for Africa that I’ve ever read! Though, in many ways, Africa needs no advertisements. And I agree that it represents the existence of a style of train travel that seems to have fallen out of style! I am glad it’s still occurring somewhere in the world! P.S. That first foto is truly “award winning” caliber. Also, we were told that the Garden route option has now been withdrawn due to lack of customers – not sure if it is the case, but it was someone working on the train that said this. Looks an expensive trip. Is there any reason you did not add prices to the post? John, I don’t often (if ever) post prices on adventures. Maybe that is something to start or at least give a range as the world is often negotiable. And you are correct, it certainly is not cheap, but it is rather luxurious. Sign me up! This looks amazing. Leah, it was an amazing journey. highly recommend it.